A former MVP helped convince Kevin Durant to come to the Warriors—and it wasn't Stephen Curry. Last fall, the Warriors hired a famous person for an obscure position, tabbing two-time MVP Steve Nash as a player development consultant. The job description was as amorphous as the title suggests. Nash worked out a bit with Klay Thompson. He sent texts to Steph Curry. A few days every month he flew from his home in Los Angeles to Oakland. Occasionally he addressed the team, walking through actions and demonstrating ball screens. But Nash, who retired only a year ago, was not looking for a full-time gig. He is a father of three, the general manager of the Canadian national team and a promising movie producer. In 2014, when Nash was still a Laker, he agreed to film conversations with other luminaries for a Vice Sports series called “Back & Forth.” In the most notable video, Nash sits on a black leather sofa, wearing a T-shirt and shorts. Next to him, appearing equally casual, is another former MVP: Kevin Durant. With Nash steering the dialogue, they reflect in hushed tones on their roots, motivations and methods. Durant tells Nash that he used to create imaginary basketball games as a boy, using Hot Wheels as players, pennies as balls and tables as courts. They laugh. They connect. Representatives from six teams passed through the gates of the Hamptons mansion where Durant spent the July 4th weekend. The Warriors presentation wasn’t necessarily more memorable than the others. “We heard the Clippers ‘blew him away,’” says Golden State general manager Bob Myers. “We didn’t blow him away.” Durant was most struck by the body language of the four players in the room—Curry, Thompson, Draymond Green and Andre Iguodala—their effortless conversation and easy laughter. He remarked that they looked as if they were holding hands, even though they were not actually touching. Durant had heard all the breathless accounts of the Dubs’ renowned esprit de corps. He wondered whether their kinship was real, and if it was, whether there was space for another in that cocoon. Those were the questions that nagged at him after the gang left. The Warriors did not lure Durant at the meeting, but in the 48 hours that followed. They are a collaborative organization—remember Nick U’Ren, the lower-level staffer who suggested the lineup change that helped capture the 2015 championship; and Chris DeMarco, the player development coach who recommended switching sides of the court in Game 6 of this year’s Western Conference finals—so it should come as no surprise that free agency was also a group effort with contributions from unlikely sources. Warriors’ advisor Jerry West made headlines with a phone call, but Durant shared more fundamental concerns about chemistry and fit in conversations with Nash. Myers was expecting the qualifier. He had prepared a concession speech, thanking Durant for his consideration, wishing him well in Oklahoma City. 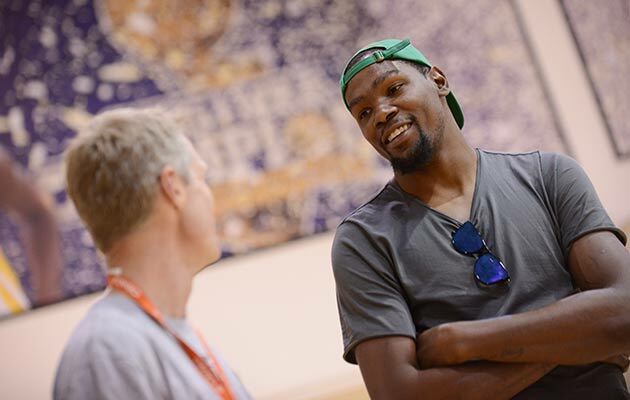 “But I just want to tell you I’m coming to the Warriors,” Durant continued. He wasn’t purposefully messing with Myers. He was rattled and fried. When word of his announcement reached Kerr, on vacation in Hawaii, the sun wasn’t up yet over the islands. “We got him! We got him!” hollered Kerr’s wife, Margot, turning over in bed and waking him with jabs to the leg. There was euphoria in Golden State and agony in Oklahoma City, same as six weeks before, in the wake of the West finals. But the pain was more acute this time and will take longer to subside. Before every game last season, Thunder head coach Billy Donovan slipped into Durant’s locker a hand-written note. Sometimes it was about leadership. Sometimes it was about defense. Sometimes it was just about the upcoming matchup. It was a simple gesture, one of many, underlining OKC’s dedication to Durant. Yes, Westbrook pounds the ball more than Curry, but Westbrook is still one of the three best point guards alive. Yes, Golden State’s attack is more fluid than Oklahoma City’s, but the Thunder still put up the second highest offensive rating of any team in the past five years. If they cannot retain a marquee free agent, after coming up five minutes short of the Finals, what small market can? Westbrook wasn’t the only iso-heavy star in Oklahoma City; Durant also liked to hold the ball. But the Warriors are enamored with the potential of his playmaking ability. They envision running offense through him at the elbow and in the post, where he can kick to shooters and cutters if the defense collapses, or rise and fire if it doesn’t. With Curry and Thompson spreading the court, Durant will enjoy massive swaths of space, and he may never see a double team again. “It should be seamless,” Kerr said. The Warriors don’t have a rim-protecting center, or many qualified reserves, having discarded a chunk of their rotation to make room for Durant. But those are Dom Perignon problems. The Big Four, plus a stiff in marketing, could probably win 50. The first day, though, was not easy. 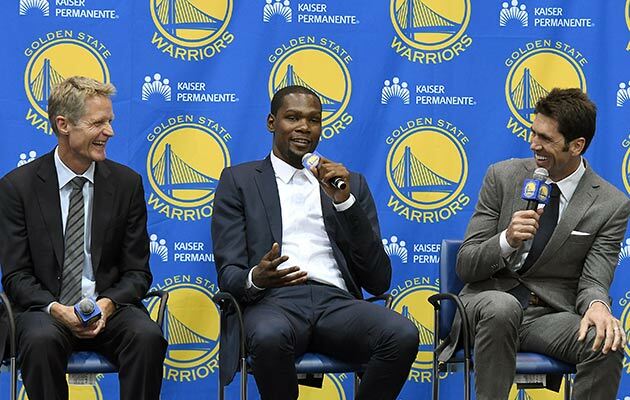 At his introductory press conference, Durant sat stiffly atop the dais, bracing for the inevitable queries about shortcuts to titles. When Kerr suggested he might bring his shiny new acquisition off the bench, everybody laughed except Durant, causing the coach to clarify. “I’m joking,” he said. Eventually, Durant warmed up. “We live in this superhero comic book world,” he said, “where you’re either a villain or you’re a superhero…I trusted my gut. I trusted my instincts. It’s the unpopular decision. But I can live with it.” From the Philippines, where Canada participated in an Olympic qualifying tournament, Nash downplayed his friend’s quest for NBA gold. “I think it was as much a personal move for his happiness and development as it was to win,” Nash told reporters. Late Thursday, after a week of advice, introspection and upheaval, Durant went looking for a little of the joy the Warriors talk so much about. There was only one place to go. He wrapped up his press conference and walked onto the practice court. Far from the meetings and the mansion, he grabbed a ball and took a shot.